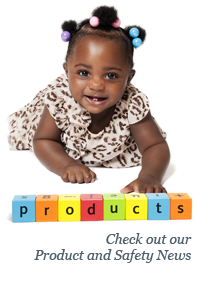 Safe Kids is committed to keeping you informed about recalls of kids’ oriented products. While it is important to keep aware of all recalls, Safe Kids urges you to pay particular attention to ones in red, as they are associated with one or more deaths. 06/16/14 FDA: Wegmans is voluntarily recalling cinnamon raisin buns because they may contain undeclared egg, posing a possible allergen hazard. 06/16/14 FDA: Vita Food Products, Inc. is voluntarily recalling smoked Atlantic salmon due to possible contamination with Listeria monocytogenes. 06/13/14 FDA: Schnucks Bakery is voluntarily recalling cake due to undeclared pecans, posing a possible allergen hazard. 06/12/14 FDA: La Finguita is voluntarily recalling cheese due to a potential peanut and tree nut contamination, posing a possible allergen hazard. 06/12/14 FDA: Fish Family Farms Inc. is voluntarily recalling milk and cream due to a potential peanut and tree nut contamination, posing a possible allergen hazard. 06/11/14 FDA: Smith’s Country Cheese is voluntarily recalling gouda cheese due to a possibility of Listeria monocytogenes contamination. 06/11/14 FDA: Wegmans is voluntarily recalling bagged iced due to the possibility of metal fragments in the ice. 06/08/14 FDA: Dole is voluntarily recalling garden soup due to undeclared milk, posing a possible allergen hazard. 06/08/14 FDA: Lansal Inc. is voluntarily recalling egg white salad with chives sold at Trader Joe’s because there is a possibility of Listeria monocytogenes. 06/06/14 FDA: Olde Thompson Inc. is voluntarily recalling Ground Malabar Pepper due to a possible salmonella risk. 06/06/14 FDA: Diabetic Supply of Suncoast, Inc. is voluntarily recalling blood glucose test strips due to a labelling error. 06/05/14 FDA: Eillien’s Candies Inc. is voluntarily recalling sponge candy because the product contains undeclared milk, posing a potential allergen hazard. 06/04/14 FDA: Ocean Spray is voluntarily recalling yogurt-covered dried cranberries because they may contain undeclared peanuts, posing a potential allergen hazard. 06/04/14 FDA: Rite Aid is voluntarily recalling ice cream because of undeclared pistachios, which may pose an allergen hazard. 06/02/14 FDA: Baptista’s Bakery Inc. is voluntarily recalling rosemary and olive oil crackers because they may contain salmonella. 06/02/14 FDA: Glutino is voluntarily recalling rosemary and olive oil crackers because they may contain salmonella.